Is it just me or did summer seem to pass us by in the blink of eye? 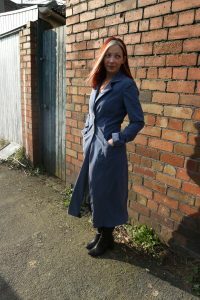 I seem to have abandoned all hope of sunshine and am now honing in on my winter wardrobe. 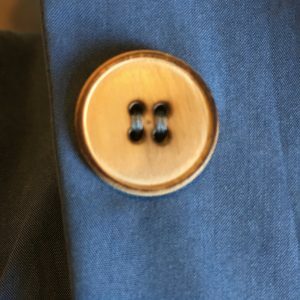 As I am now working in a more corporate environment than the last few years, I am finding that my handmade wardrobe needs a bit of a reboot. 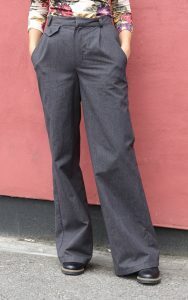 One noticeable gap was a really good pair of tailored trousers. 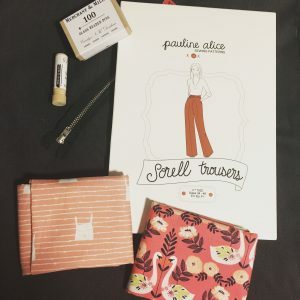 I spotted the Sorell trousers by Pauline Alice on Instagram a few weeks ago and immediately a dark grey pair sprung to mind and, as luck would have it, when I visited Backstitch in Cambridge last week, they had the perfect fabric. 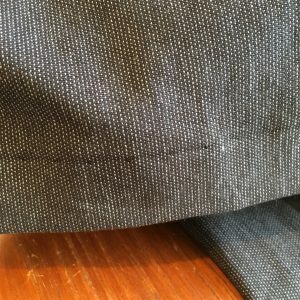 It is a charcoal grey cotton suiting with a tiny bit of a nap so that when you run your hands across it, one direction is definitely smoother, so I bore that in mind when cutting out the trousers. As they stocked the printed patterns as well at Backstitch, I bought that too, as the packaging is so pretty. 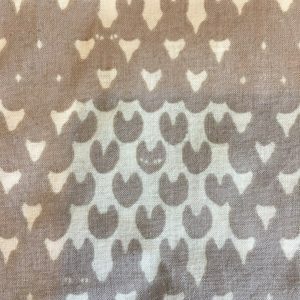 I had some of this gorgeous Miss Matatabi cotton lawn left over from making a top. If you look closely, they are actually tiny cats! 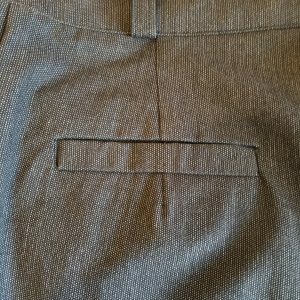 There are two versions of the trousers, you can make a patch pocket version, but I opted for the welt pockets as I thought they looked smarter. 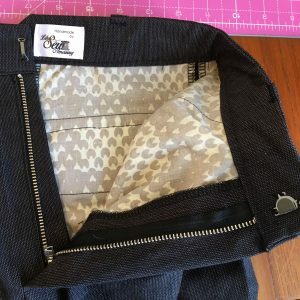 The welt pocket instructions seemed a little confusing and are unlike any other welt pockets I have sewn before, so I was a little nervous about going ahead, as once you’ve slashed into them, there is no going back! Luckily, I checked on Pauline Alice’s website, and she had done quite a detailed tutorial on making the trousers, so I read through that thoroughly and it put my mind at ease. I decided to make the pockets one at a time, just in case I messed up, as then I wouldn’t have ruined both sides of the trousers! The first side took me about 40 minutes to figure out, but I got the second one done in 5 minutes, so it is a breeze once you know what you are doing. 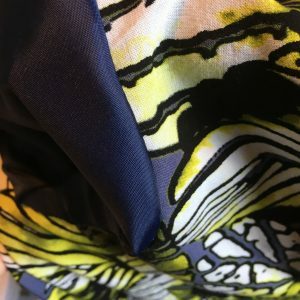 My only mistake with the welt pockets is that because the lining is all cut from one piece of fabric, my print ended up being upside down due to the way it is folded. 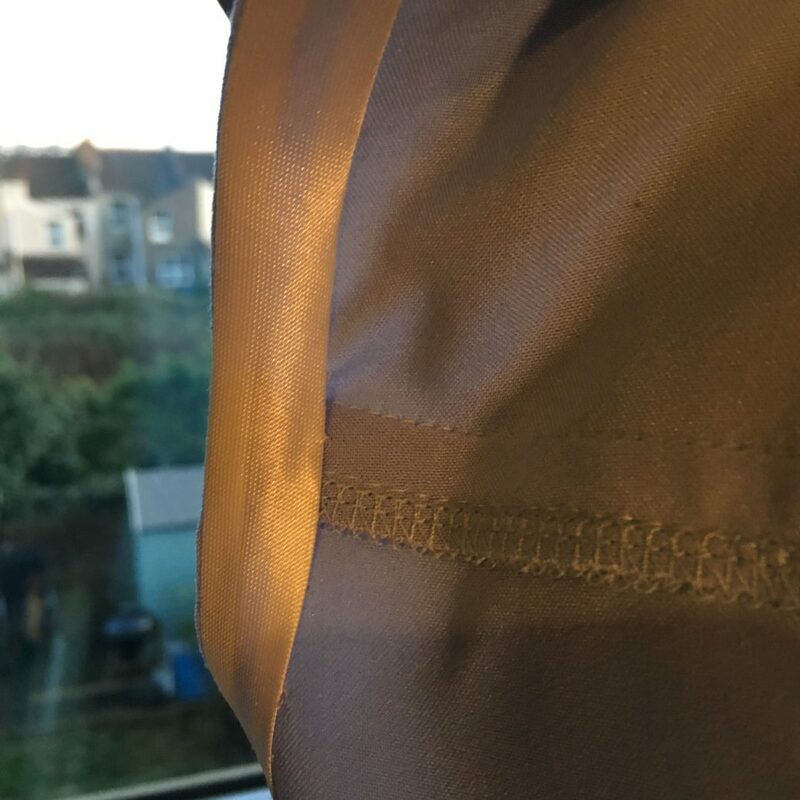 Not a massive big deal as it is on the inside, but it does annoy me slightly and I think that if the pattern piece was the other way around, it would resolve this issue. 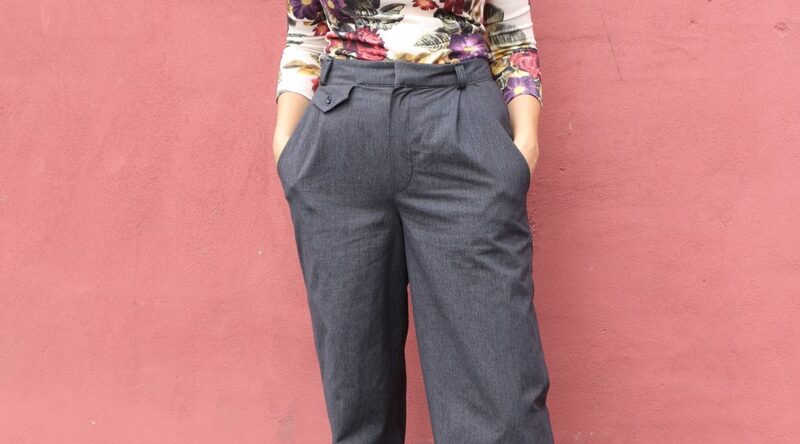 I love the tailored details of the Sorell trousers. 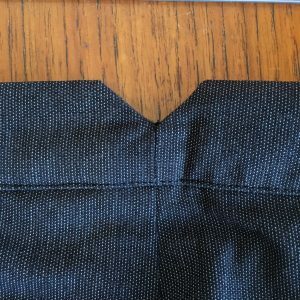 The dip in the back waistband, is a technique used in men’s tailoring, and gives them a really lovely finish. 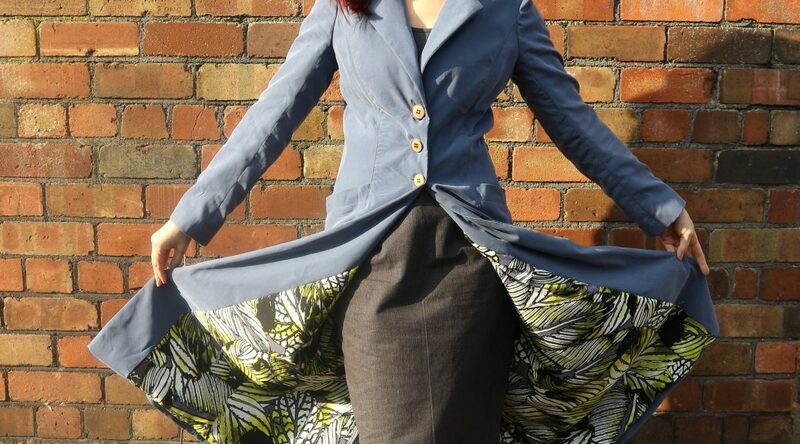 I also love the fully functioning watch pocket on the front of the trousers! 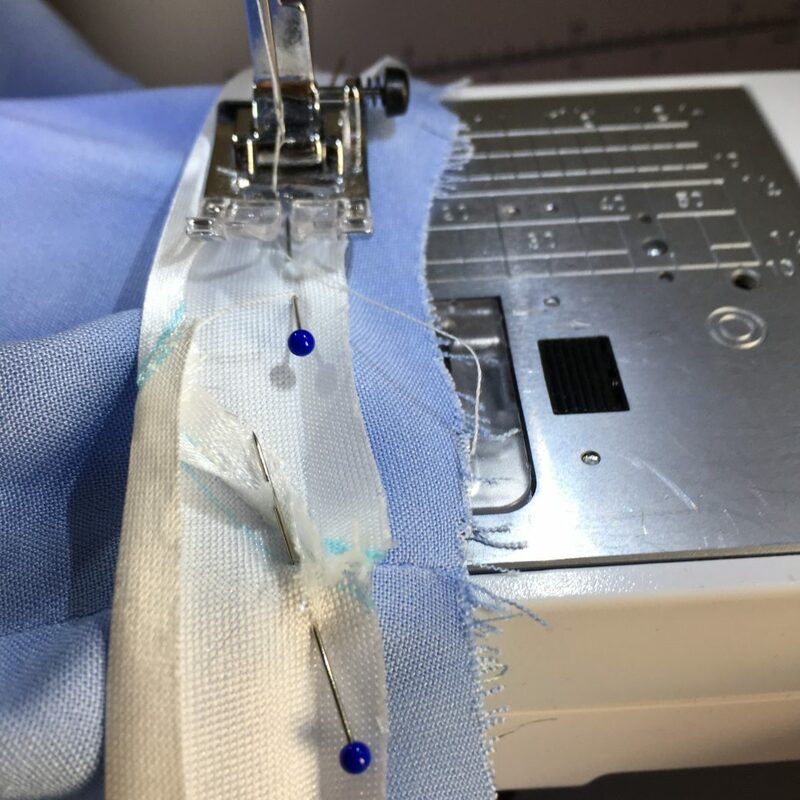 This can be a little bit tricky to sew and you need to be absolutely sure of the fit before you add this in, as there is no going back afterwards! 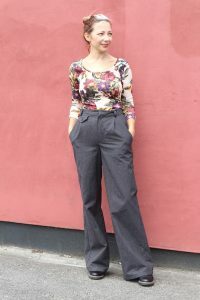 I made my trousers in the smallest size, as I like high waisted trousers to really fit well, with no gaping at the back. I did, however, let out a quarter of an inch on both side seams after trying them on as the fly front was pulling off to the side ever so slightly. 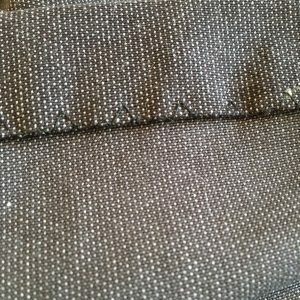 I hemmed mine using the blind hem function on my machine. It gives a really lovely finish and saves all of that pesky hand sewing! You can see in the pictures below what it looks like from the inside and outside. 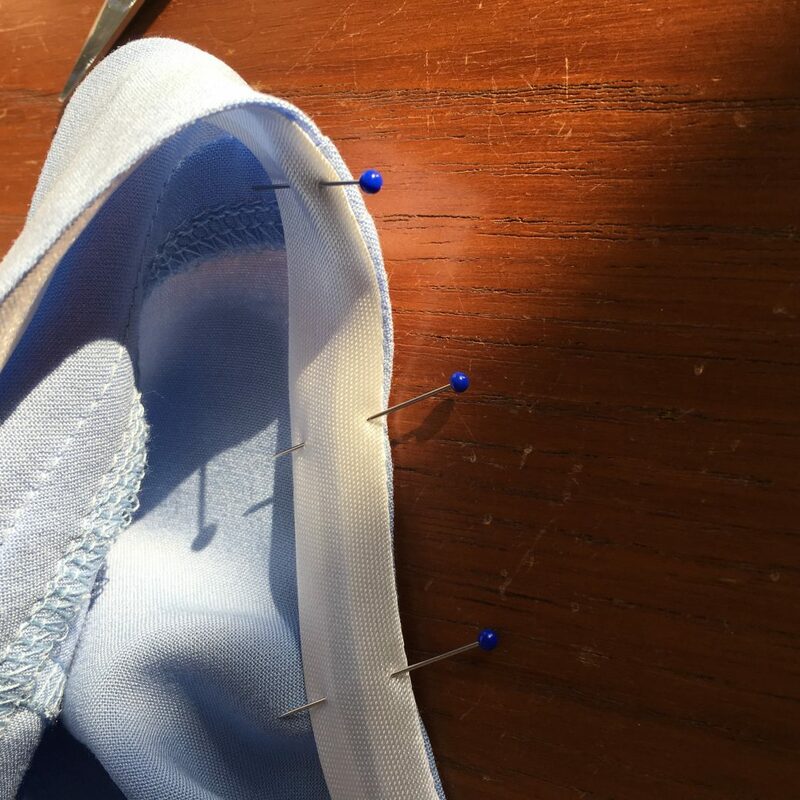 If you would like me to do a tutorial on how to use the blind hem foot, please let me know. 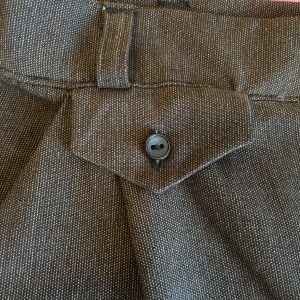 Rather than a buttonhole on the waistband, I opted for a trouser hook and bar as I wanted a clean finish on the outside.They are a bit fiddly to attach but I think the finished look is worth it. 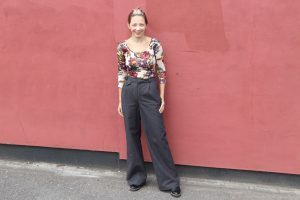 I really love the look of these trousers and I think they will be a real staple in my winter work wardrobe. I’ve purposely left them a little long so that I can wear heels with them, but I also think they will look fab with a pair of brogues. I’m thinking a pair in a black stretch cotton will be next on the list! 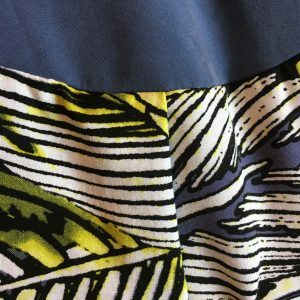 I have a enough fabric left over for a pencil skirt, so if anyone has any pattern recommendations, please let me know! 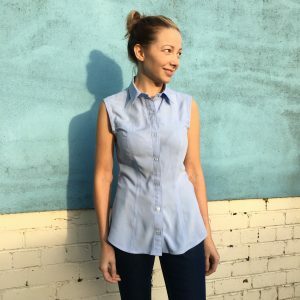 The Rosa shirt by Tilly and the Buttons is on my Make Nine list for this year. 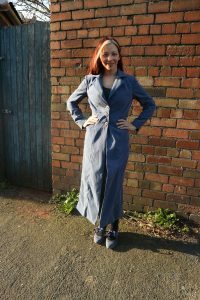 I have actually had the pattern since it was released and even had the fabric washed and ready to go but just hadn’t got round to making it. 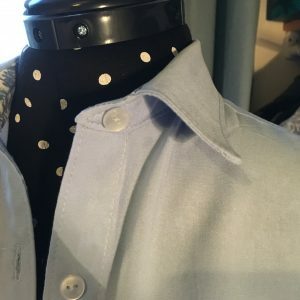 I have made quite a few men’s shirts before, so am quite familiar with tailoring techniques and was really keen to sew a nice button up shirt for myself. 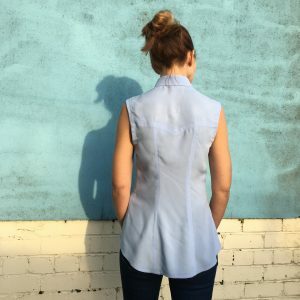 I was going to start with the shirtdress option but I then changed my mind and decided to sew up the shirt version in a stunning cornflower blue viscose that I bought from Sewn. This is one of my all time favourite colours – so much so, that the front of my house is painted in this shade! I chose a floral blue and white cotton for the button stand, collar stand and the inside of the cuffs (more on that later). 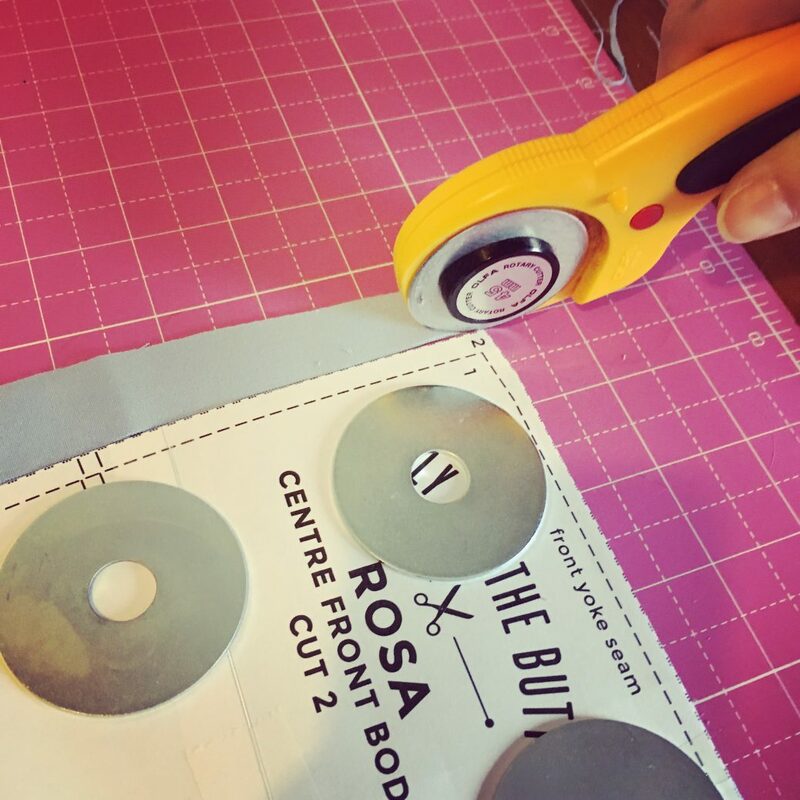 Cutting out the viscose was a little tricky. 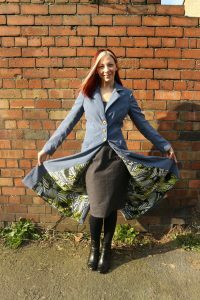 Despite a new rotary blade and lots of pattern weights, the fabric slipped and shifted around like nobody’s business! 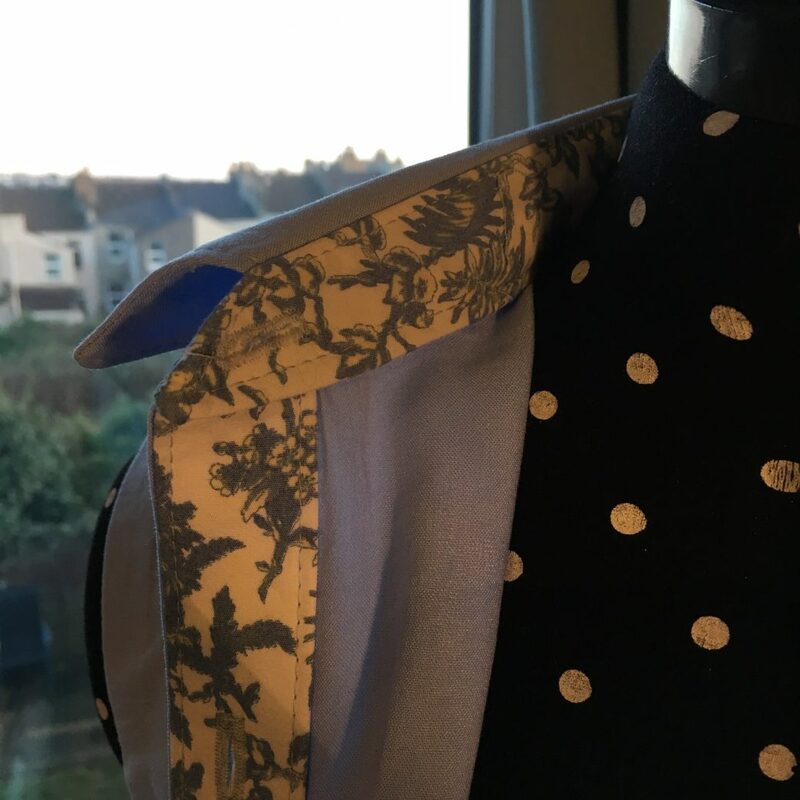 Most of the pieces were ok, but the collar and collar band were pretty unrecognisable from their original shape so I decided to interface both pieces , rather than just the upper collar and band. 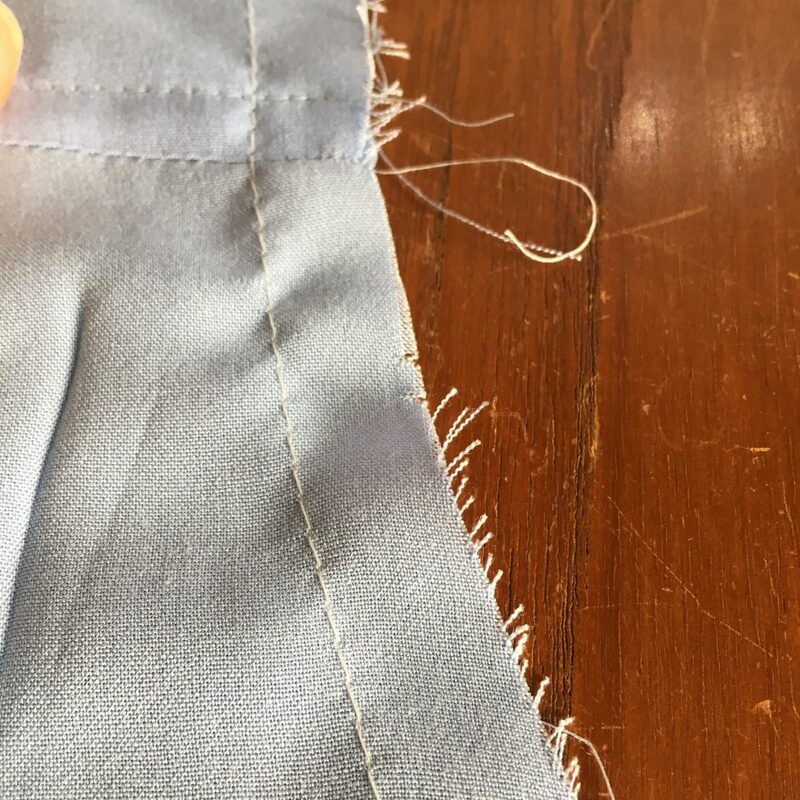 In order to do so, I cut the pieces out of the interfacing first, and then fused them to the main fabric, before I cut it out. 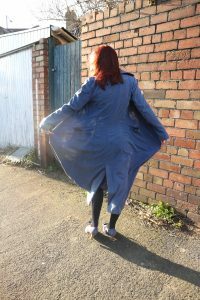 I only used a lightweight interfacing and it worked out pretty well. As the viscose was pretty lightweight and drapey, I decided not to use a traditional thicker topstitching thread as I thought it would look out of balance. I just used the matching polyester thread that I was using on a longer stitch length of 3.5 for any topstitching. I had decided to use the longer cuffed sleeve bonus pattern that Tilly released after the main pattern was on sale. 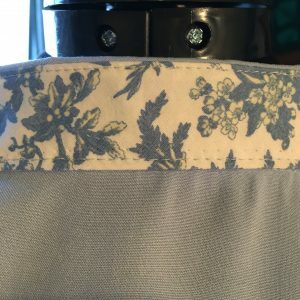 I made one modification though as I recut the cuff pattern so that I could have the contrast fabric on the inside of the cuff. This was all going well, until I tried the shirt on during construction to check the rough fit and found that I really loved it as a sleeveless shirt!! I therefore decided to abandon the sleeves and finish the armholes with some bias binding instead. 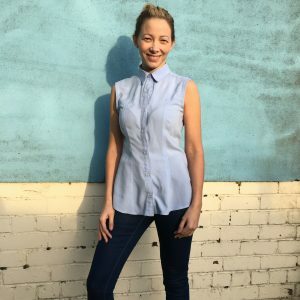 I promise that it has nothing to do with the fact that I hate ironing sleeves. OK, maybe it has a little to do with it. Overall, I am really pleased with the result. 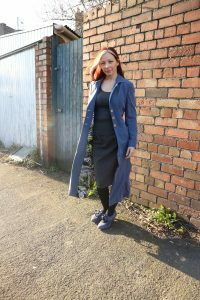 It will be perfect for the Spring/Summer, but I think I can get some good wear out of it now, with the aid of a thick cardi! So that is four makes out of nine done, and January isn’t over yet!